On the very first page of my binder, I’ve printed out a chart to map my revision goals for this summer. I fill in a box for each chapter as I finish my revisions for it. First Pass: Plot Consistency. Wherein I slap all my disparate notes together so that the story, while not pretty, at least makes sense and follows my plot outline. Second Pass: Word Count. Here, I’ll go line by line and really hack and slash to get each chapter to the length I want it. Third Pass: Readability. The third round of edits will involve reading the whole WIP from beginning to end and making notes on anything that glaringly needs to be changed. I’ll color in each chapter as I finish these final edits. Final Pass. Hopefully the quickest round of edits, this will be a final read through and last minute polish. By the end of the final pass, I’ll (with any luck) have a story that’s readable, comprehensible, and — hopefully — publishable! It’s virtually impossible to keep in your head everything that you need to do in order to make your story work. For me, it makes more sense to prioritize setting my plot in stone before I tackle hacking the word count or polishing up weak sentences. Giving yourself smaller steps (and deadlines to adhere to) makes the process go infinitely smoother. Following my productivity map, I have a general chapter-by-chapter outline of my story. I summarize the events of each scene in every chapter, and have notes throughout on the basic plot structure: a description of Act One, for example, or a brief summation of my goal for the Dark Night of the Soul. This has proved the handiest portion of my binder, and the one I turn back to the most often. Sure, I have my plot outline on my computer, but it’s been really helpful to have a hard copy to reference while working. Having succinct summaries of each chapter on hand has helped keep me focused as well. One of the hardest things about editing is that there are so many options, and you can find yourself diverted and straying too far from your outline. Spontaneity is great and everything, but your plot needs to make sense, so it’s good to have a firm idea of what your chapter needs to accomplish as you sit down to edit. You can read more about each of these structural points in my post Plotting In A Pinch: A Guide to Plotting Your Novel. Within each section I put all my notes and a full breakdown of the chapters in each section of the novel. This is especially helpful, because I can consider each chapter’s larger context in the overall plot and use that to focus my revisions on what’s really important. And, finally, I have a fat little folder in the back of my binder for all my loose bits — including an envelope for a power bill that I wrote a potential query on! I bought this six-pocket folder at Staples, and it’s been great. I use it to store hard copies of chapters that I’ve printed out to work on, notes I’ve scribbled on random papers (such as power bills…), and anything else I want to keep close at hand while I’m working. The folder definitely makes my binder heavier than it would’ve been otherwise, but since this binder didn’t come with pockets already, it’s a really useful addition. So, there you have it, writerly lovelies, my Revision Binder! I mean, I still spend 90% of my Revision time staring blankly at my computer, quietly swallowing down waves of panic … but at least I do so with the illusion of organization, right? 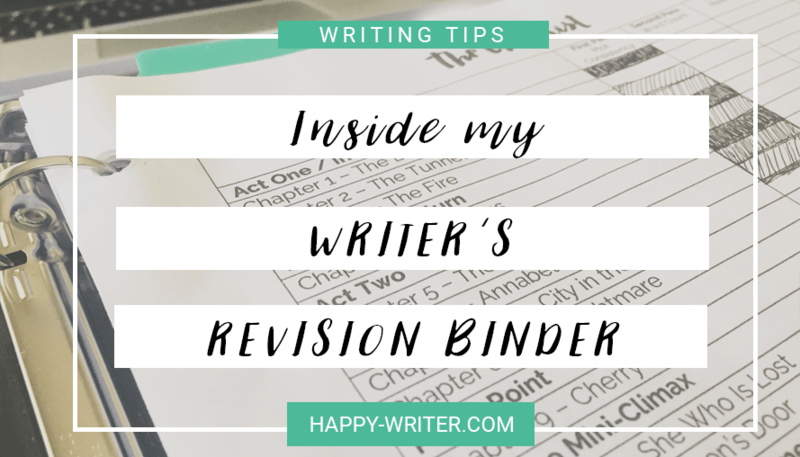 And this binder layout doesn’t have to just apply to the revision process — I think it would be immensely helpful for someone keeping their first draft organized, too! Whatever you’re working on, keeping your mountains of notes organized and under control is a really, really good habit to make. How do you organize your revision notes? Are you drowning in edits as well, or still plugging away at your first draft? Leave a comment below, let’s talk! If you have a writing binder, or you decide to make your own based on this post, send me a picture, I’d love to see it!! You can leave a comment here, or @ me on twitter (chuffwrites) and instagram (yellowhairedrobot). I love this idea!!! No seriously…I’ve been taking a hiatus from editing for about a week – partially for personal reasons, but mostly because I got so overwhelmed by the amount of work I have to do. I really like the way you set up a binder specifically for the project. I think I tend to get overwhelmed because my draft AND my notes are all in Scrivener – which is convenient, but it gets overwhelming trying to switch back and forth between different sub-documents. Thanks for sharing this! Omg, I’m so glad this idea could help you!! I love using Scrivener (because otherwise I have literally 1000+ documents on my computer, all of different bits and pieces for my projects), but it helps me out SO much to have something tactile and tangible I can hold in my hand to work from.